In an experiment, piranha were placed in a large tank separated from their food by a see through glass divider. After several days of ramming their heads against the glass divider the piranha learned that it was a futile effort to try and get the food. The glass divider was then removed yet they starved to death while swimming freely in a place where there was food available. 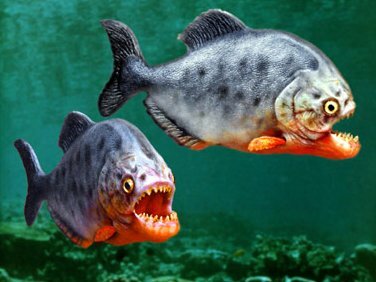 The piranha had learned that their efforts were useless and came to believe that their situation would never change so they just accepted the “reality” of their experience. Youth are especially susceptible to limiting beliefs about themselves. When we make assumptions about students based on externals (i.e., clothing, music, language, behaviors, etc.) we often reinforce those limiting beliefs that they hold or are told about themselves. Think for a moment how this might impact how you approach a new student. Think about your personal values and biases and how they impact the initial encounters with students you are trying to connect with. 1. John – He shows up to your youth group on Sunday night with some of the other popular kids from your church. He is wearing a football jersey and is relatively good looking. He appears to be very outgoing and has an air of confidence about him. You instantly like him and are drawn to him. In your mind you envision him being a primary influencer of other students and hope to get him on board with being a peer leader. You can see that potential within the first few minutes of meeting him. 2. Sarah – She shows up wearing dark eyeliner, dark clothes, and her hair is dyed with blond, pink and black highlights. He black cargo pants are too big and have babypins up and down on leg. She wears lots of bracelets on her wrists and her shirt is a concert tee from the band Rise Against. She moves slowly and doesn’t talk to a lot of other students. She has writing on her hands and arms as well. You assume she comes from a home where her parents don’t pay much attention to her (because who would let their kid leave the house looking like this, right?). She’s probably a cutter, which means she’s probably been abused or at the very least is depressed. This kid really needs Jesus and you will do your best to introduce her to the one that will make it all better. 1. John – He sells prescription drugs he gets from doctors from an old football injury. He sells his Vicodin to his friends so they can amplify their buzz while drinking. He also steals the Vicodin from his mother’s purse when she’s asleep to buy alcohol with. She sleeps so much because she has to work two jobs because John’s dad was recently layed-off and has been drinking to manage his depression. His motive for coming to your youth group was to find new customers to sell his product to. Nobody suspects him because he looks like the “All-American Boy” and is an athletic hero for your small community. 2. Sarah – She has an intact family that is supportive and allows her to be expressive of her identity. She is artistic and writes poetry, draws, and plays the piano. He heart breaks for her friends and she wants nothing more than to see them come to youth group and find and follow Christ. She has a prayer journal bigger than your bible and most of her prayers are for her hurting friends. She volunteers at the Special Olympics because her younger brother has Downs Syndrome and she is passionate about helping others. She sometimes feels alone but is usually emotionally secure. People tend to avoid her because of how she looks and dresses. Back to the piranha, when we respond to students, based on our perceptions, biases, values, and expectations there is the possibility that we will play a role in limiting who they were created to be. If the case of John, people can unintentionally reinforce his sinful behavior by acting only on their assumptions that his is the “All-American Kid” and worthy of our praise. The result is that John learns that all the bad stuff he is doing is ok so long as he continues to play the roles we want him to play. In the case of misunderstood Sarah, it won’t be long before she submits to the preconceived ideas and expectations that other hold her to. It’s hard for a solitary teenager to stand up underneath that kind of force, regardless of how supportive her family is. Her joy and confidence will leak over time. As we approach students in an effort to connect let’s check our biases and expectations at the door and just allow the students to be who they are, the good, the bad, and the ugly, because that is honest. It is authentic. It is transparent and it’s a great place to start. What kinds of kids do you most naturally connect with? What kinds of kids do you struggle to connect with? What role, if any, do your personal biases play in how you interact with both kinds of students? What would help you remain objective when first meeting a student?